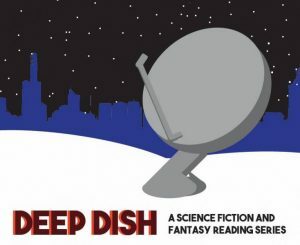 In October 2017, the SLF partnered with SFWA and CNSC (Chicago Nerds Social Club) to create a SF/F reading series in Chicago, hosted at Volumes Book Cafe. If you’re interested in reading with us, drop our Director, Mary Anne Mohanraj, a line at director@speclit.org, with the subject line SLF READING SERIES. Please include a few lines about your writing thus far, although we do try to include a mix of emerging and established writers; you need not be published to participate. If you have a new book coming out, though, do let us know — we’d love to feature it! March 2018: featured Mary Robinette Kowal and Sandi Wisenberg, with Aurelius Raines II, A.D. Jameson, Kevin Wabaunsee, Dawn Bonanno Hebein, and Scott Huggins. December 2017: featured debut novelists: Michael Moreci and Sue Burke, with Angeli Primlani, Valya Dudycz Lupescu, Stephen Segal, and Dan Gonzalez. October 2017: featured novelist Mary Robinette Kowal, debut novelist Cath Schaff-Stump, host Mary Anne Mohanraj, plus Chris Bauer, Richard Chwedyk, and Meg Khoury.